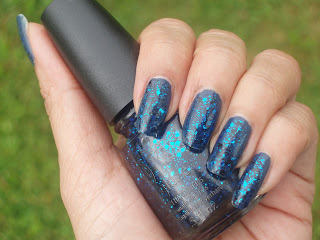 Since we have been having so much rain in the last week, I have a very sparkly but dark NOTD for you today. The star is China Glaze Mosaic Madness. This is 2 coats of Mosaic Madness, just because I was greedy for glitters. The base is Orly Blue Suede. I just wanted a pigmented dark navy, didn’t mind if it was matte at the time. 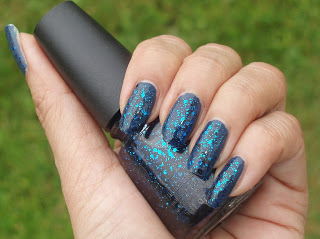 This was just one coat of Blue Suede, it worked perfectly as a dark canvas for the blue glitters in Mosaic Madness to shine. However, Orly mattes don’t last long on me, which I should have considered. This mani only lasted a day on me Next time, I’ll change up the base. The first pic was with flash, showing more depth to the look than in the second pic with natural lighting. I love it either way anyway. Another pic, just to make the point lol. Removing this mani was not pleasant, as with any glitter layering, but I was used to it. At least the base helped that a little as the flakes did not stick directly on your nails. Hope this brightens your day with its darkness/ madness (pun intended). Thanks for the moving tips some of you left on my previous post and on twitter. I am so overwhelmed lol.